This little town has a big heart. 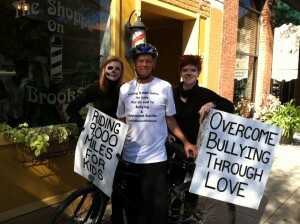 From the moment I rolled The Kindness Bicycle out, I was met with applause from a passing cars’ passengers. What a great way to begin a great day. Rachel a volunteer from the Sumter SPCA stopped by The Kindness bus to offer Bogart some treats. She is a huge lover of animals and enjoyed sharing stories of her family’s pets. She made a donation for one of the Bogart books and even came back later in the day for another copy. Visit www.sumterscspca.com to see the great work they are accomplishing. Kayla and Kayla from The Shoppe on Brooks, were face-painted for Halloween and posed for today’s picture. Ruthe, the owner of the Shoppe, was so moved by the ride, she made a donation. I stopped by the Manning Firehouse and 3 schools in this town and received the “Red Carpet” welcome. Christina, owner of the local cafe, insisted on buying me coffee, and Deanna, a local mother of two girls, dropped off a gift card from a national coffee chain. The Clarendon County Chamber of Commerce loved hearing of my travels in their town. Erin Chandler of the Morning Times was enthused about including her hometown in our travels and is writing an article in her paper. Thank you to Lonnie and Duncan a couple of local residents, who volunteer in their retirement. Thank you to everyone who helped to make my brief stay in this very friendly town, as good as it could be. This entry was posted on Wednesday, October 31st, 2012 at 9:13 am	and is filed under Kindness. You can follow any responses to this entry through the RSS 2.0 feed. You can leave a response, or trackback from your own site.